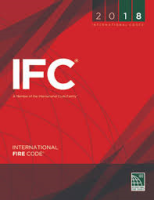 A fire alarm system is used primarily to evacuate the premises in the event of occurrence of a fire condition and then secondarily to report the fire to the proper authorities. A fire alarm system differs somewhat from a security system. The security system only recognizes two states or conditions: normal or alarm, and cannot differentiate between a line break and the opening of an alarm switch. The fire alarm system recognizes four different states or conditions: normal, alarm, trouble and supervisory. 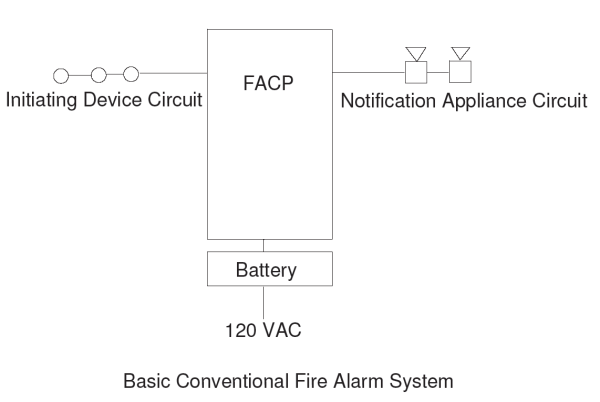 Simplistically speaking, a basic system consists of a fire alarm control panel (FACP) to which are connected initiating (input) devices, notification (output) appliances, a source of operating power, and a source of standby power in the event the operating power should fail. 1) Accept an alarm or supervisory input from an initiating device. 2) Provide an alarm output to the notification appliance(s). 3) Monitor the integrity of the panel itself and also the wiring to the above devices. Fire alarm systems have changed dramatically over the past few years, primarily due to the ad- vent of the low priced microprocessor. 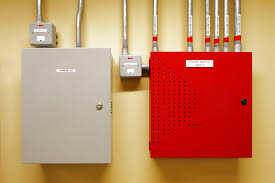 Basically there are two different approaches used for the fire alarm control panel, conventional and addressable. We are concerning ourselves in this installment with the conventional (hard-wired) system as opposed to an addressable system, which will be covered in a following installment. The secondary power supply (usually a battery) automatically furnishes operating power to the system in the event of failure of the main 120 VAC supply or if the main supply voltage falls below 85% of normal (“Brown-out” condition). The battery must be of the rechargeable type, since dry cells are not permitted. The battery must operate the system for a specified period of time in a standby or quiescent condition, 24 hours, and have sufficient reserve at the end of the standby period to operate the panel in an alarm condition for a period of five (5) minutes. Batteries are required by the National Fire Alarm Code in all fire alarm systems not having multiple standby generators. The control panel must also be capable of recharging the battery within a specified period after a discharge. Initiating devices employed in a supervised, conventional system usually have normally open, ‘dry’ contacts which close on alarm. (‘Dry’ contacts are contacts that have no voltage applied to them.) Exceptions to this are 2- wire smoke detectors, which receive their operating power from the (supervisory) current flowing through the circuit, and alter the characteristics of the circuit when they go into alarm. The act of operating a manual station or actuation of an automatic detector closes the contacts of the device and applies power to the alarm circuitry, causing the panel to go into alarm, light one or more red LEDs on the panel, and energize the notification appliance(s). This appears to resemble the classic operation of a doorbell system, but the BIG difference here is that the fire alarm control has the ability to monitor it’s own integrity, commonly referred to as supervision. A supervised system (sometimes referred to as a “closed circuit” system) will create a trouble signal in the event of a break in the field wiring, disconnection or removal of an initiating device or notification appliance, failure of main operating power, disconnection of the standby battery, or off-normal position of a panel switch. A trouble condition will light one or more yellow LEDs on the panel and cause an audible signal, (usually a piezoelectric device) to sound. The audible signal can be silenced by operating the ‘Trouble Silence’ switch on the panel. Since the panel is locked, the trouble sounder can only be silenced by authorized personnel who have access to the key. In a conventional system, supervision is made possible by use of an ‘End of Line’ (EOL) device, usually a resistor, although other components may be used, depending on the designer. Many years ago, manufacturers used relays to achieve supervision. Two relay coils, alarm and supervisory, were connected in series with the initiating device circuit. The supervisory relay was rated at a lower voltage and was continually energized by the reduced current flowing through the circuit via the EOL device. 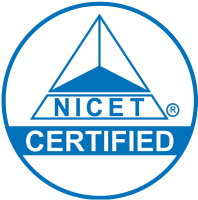 The alarm relay was rated at the operating voltage and would only energize when the current was increased by an initiating device that short- circuited the EOL device. If the circuit is opened by a break in the wiring, or unauthorized removal of a detector or station, or if the winding of either relay opened, the trouble relay contacts would fall out, applying voltage to the trouble LED and sounder. These relays were eventually replaced by solid state components, mostly microprocessors, that monitor the circuit supervisory current. In the event of a break in the outside wiring, unauthorized removal of a detector or station, failure of the main power supply, or removal of the EOL device, the microprocessor will sense the change in circuit current and create a trouble condition, energizing the yellow System Trouble LED, a yellow Zone Trouble LED dedicated to that circuit, and an audible sounder inside the panel, signifying a trouble condition. The sounder may be silenced by operating a ‘Trouble Silence’ switch, but the yellow LED(s) will remain lit. Once the trouble condition is rectified and the circuit in question is restored to normal, the audible signal will sound again, or ‘ring back’. The trouble silencing switch is then restored to the normal position, silencing the sounder and extinguishing the Trouble LED(s). In the event of an alarm, the contacts in the initiating device close, shunting out the EOL, raising the circuit voltage to full operating voltage, and energizing the alarm circuitry. The alarm circuitry will then ap- ply operating power to the notification appliance circuit, sounding horns, flashing strobes, and performing other functions.